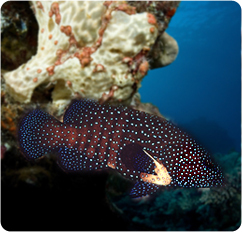 A medium size grouper, reaching about 1 foot; can be somewhat shy and hide in the back or behind rocks. This will change when feeding time comes as it will be out in front looking for food. Shouldn’t be kept with small or non-aggressive fish as it will look to eat them or harass them to death.